Just minutes after it was announced that the Hurricanes had signed Tomas Kaberle news of the Bruins trading a fourth round pick to the Hurricanes for Joe Corvo. The 34-year-old defensemen fills the gap that Kaberle left after signing and brings a physical game that should fit in well on the Bruins blue line. Joe Corvo will make $2.5 million in the final year of his current contract. Corvo put up his second-best numbers in his career last year scoring 11 goals and netting 40 points while going -14 on a bad Carolina defense. He plays well in the corners and has some hands on him but doesn’t go to the box very often, getting just 18 penalty minutes in 82 games last year. I like the signing for a lot of reasons. Not only does Corvo provide insurance on the defense but he brings experience and skill to an already experienced bunch. The Bruins didn’t rest on having a top six, knowing that injuries will happen, and now have a nice competition between Corvo, Steven Kampfer, Adam McQuaid, and Johnny Boychuk which should keep the younger blue-liners hungry. Corvo also has a big shot from the point and could be a second-line power-play guy. Corvo has moved around a few times in his career which many could see as an indictment on his play but remember that Dennis Seidenberg kicked around before settling into Boston. I see Corvo really benefitting from playing in the Bruins system and alongside a deep defensive corps and providing a nice surprise for Bruins fans who only see 34-year-old journeyman. It’s another low-risk deal by Peter Chiarelli, who clearly likes what the Bruins have become and in this market, it’s wise to sign these kind of deals. Less than six months after the Bruins traded away Joe Colborne, a first round draft pick in 2011, and a second round pick in 2012 to the Leafs for Tomas Kaberle the Kaberle era has come to an end after the puck-mover signed a three-year deal worth $12.75 million with Carolina. Kaberle’s tenure in Boston will be viewed as a failure in an individual sense but a rousing success in a team perspective. 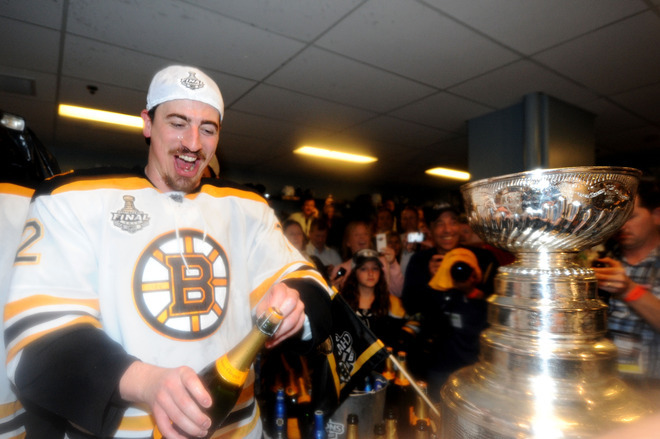 How much Tomas Kaberle added to the Bruins Stanley Cup run is questionable at best but the sting of trading away a boatload for an underwhelming player wore off a hell of a lot on June 15th. Kaberle’s final numbers as a Bruin are 1-8-9 +6 in 24 regular season games and 0-11-11 +8 in the playoffs. Not terrible numbers but watching the games it was clear that Kaberle wasn’t worth the dowry the Bruins had to give up. The one area that he was brought into Boston to improve, the power-play, worsened over time with Kaberle at the point, so much so that his role was greatly reduced in the playoffs. It’s with somewhat mixed feelings that I’ll bid adieu to Tomas. He wasn’t worth the price, didn’t improve the team in any tangible way, and was an easy scapegoat on a team that struggled on the power-play but he was part of a Stanley Cup winning Bruins team, something nearly all Bruins fans thought was unrealistic just weeks ago, and for that I’m thankful. His era won’t be categorized so easily. Unlike most eras, which are judged one way or another, Kaberle’s mixed a bit of good and bad and the good far outweighed the bad. Before the free agent frenzy began Peter Chiarelli warned that the Bruins would be quiet in a weak free agent pool but that didn’t stop them from making one signing. The Bruins brought in former Canadien Benoit Pouliot on a one-year $1.1 million deal. A former 4th overall pick, Pouliot has never evolved into his potential and has sputtered through six unremarkable seasons. Pouliot has compiled 37 goals and 72 points through 183 games after being drafted 4th overall in 2005 by the Wild. Pouliot never played in more than 37 games in a single season in Minnesota and never scored more than five goals before moving on to Montreal and being labeled a massive disappointment. Pouliot improved in Montreal but hasn’t come anywhere close to living up to his draft stock. In his first full year in the NHL last year he scored 13 goals and had 30 points. For many reasons he’s a perplexing signing. He’s most notable in the eyes of Bruins fans for taking a run at Adam McQuaid in Game 3 of the first round this postseason and one-punching David Krejci earlier in the year. He doesn’t fit the Bruins system either, playing a slimy type of game that the Bruins strive to be better than. He also could bring the team chemistry down as well after his incidents last postseason with the Bruins. To me, the signing makes no sense. He doesn’t fit in and doesn’t really have a spot. The fourth line is set in stone, he won’t be the successor to Michael Ryder on the wing, and Jordan Caron is a third-liner in waiting in Providence. The move doesn’t address any of the Bruins immediate needs and is so short-term that it might not matter. Who knows, Pouliot could come into his own in Boston and surprise a lot of people but for now I detest this signing. Just before the signing Michael Ryder signed with Dallas for two years at $3.5 million per year. I would have wanted to keep Ryder around for two years at $2-2.7 million but the wackiness of the market got Ryder a nice fat pay check. Can’t be mad at that. Ryder’s tenure will be given a pass for his heroism in the playoffs, most notably his glove save. For that reason the annual brawl between the Stars and Bruins should be a little awkward. Will this be the last time Tomas Kaberle dons the spoked B? With the dawn of free agency beginning on Friday many teams are looking to deal the rights to players they don’t want to re-sign, the Bruins included. After a few defensemen were signed to dollar amounts above expectations the Bruins are trying to bolt on Tomas Kaberle, shopping his rights a few days before free agency in hopes of getting a late draft pick in return. The news looks like the Bruins are done with Kaberle for good. Kevin Bieksa recently signed for nearly $5 million a year setting the defensive market higher than expected. That, combined with a significantly raise salary cap has made for a thin market making a big dent in team’s wallets. A lot of Bruins fans are calling for the Bruins (who have cap space for the first time in years) to spend to the cap but I disagree. Why spend to the cap in a down year? It doesn’t make sense, especially in this free agent market. The Bruins seemingly letting go of Kaberle signifies that they are in good shape, and know they are. A few years ago they might have panicked with the weight of a Cup drought on their shoulders but with the Cup on Causeway street they see things more rationally. Kaberle wasn’t going to be worth whatever he commanded, at least within the confines of the rigid defensive system in Boston. The move saves dollars and gives Steven Kampfer, who played well, a chance to step up and crack the top 6. The Bruins are also more free to sign Michael Ryder to a cap-friendly deal if so they choose. Anything from $2-2.75 million for two years is decent but going over that for a player who so often takes large chunks of the season off is risky. Time will tell what this decision makes but with free agency rapidly approaching some of the questions will start to get answered. With the four best players left being defensemen the Boston Bruins drafted Dougie Hamilton from the Niagra IceDogs of the OHL. The Bruins were surprised to hear that Hamilton was still on the board at 9 overall and jumped to pick up the 6’4 defenseman. The Bruins had an interesting decision to make considering how many defensemen were left on the board but picked where they were comfortable. Ryan Murphy was the most talked about player that the Bruins could have picked for his offensive prowess and Nathan Beaulieu wasn’t far behind with his great overall game. In the end Murphy’s size were a problem and they went with the surer pick in Hamilton. What Bruins fans can expect is a big guy who can skate and has poise with the puck. Most 18-year-old d-men are awkward and robotic coming into the draft but Hamilton has a rare fluidity to his game. He can get the puck out of his own zone and chip in offensively when need be. He’s a raw player who many think could grow into one of the best players in this entire draft. I’m excited to see how Hamilton grows in this defensive corps. With both Zdeno Chara and Dennis Seidenberg on the squad for the foreseeable future they should do more than enough to help Hamilton mature physically and mentally. Having big bodies like Chara and Adam McQuaid should be great assets to Hamilton. A future defensive corps of Chara, Seidenberg, McQuaid, and Hamilton will be one of the biggest and most physical in the league. The pick also closes out the Phil Kessel Trade. Maple Leafs get: Phil Kessel. It’s a weird offseason to be a Bruins fan. Without the desperation of needing a player to put the Bruins over the top it can be easy to not care as much as normally about the draft or UFAs. Of course fans want the team to get better but there’s no longer an aching to get better immediately to chase the elusive cup. It’s already here. But the Bruins will look to add another top 10 draft pick to their organization and try to build a team that can contend for championships every year. Instead of pretending I know a ton about junior hockey and doing a full on mock draft of the first round I’m going to focus on a few names that keep popping up in mock drafts from people who know what they are talking about. A lot of people are pointing to the Bruins taking a defenseman with the 9th overall pick in the draft, something they haven’t done under Peter Chiarelli. The last time the Bruins drafted a defenseman was the underachieving Matt Lashoff in 2005, which may have pointed the Bruins away from betting on the blue line. But with the failed Tomas Kaberle era seemingly coming to an end, there is once again a need for a puck-moving defenseman. Then again, this year is unpredictable in that the Top 3 aren’t exactly penciled in yet and the top 10 is so deep it’s creating a lot of rumors. The puck-moving d-man could go earlier and the Bruins may be forced to take the best available forward despite being solid up front. Murphy is the offensive defenseman the Bruins have lacked in recent years. He can help remedy the power-play and has a good shot from the point. Combine that with speed and hockey sense and you have a very promising defenseman who could be on the blue line for the forseeable future. Murphy’s big knock is his size. He’s listed at 5’10 176 lbs. I don’t see this as much of an issue, Ray Bourque was undersized as well and he did okay. The B’s need on the blue line plus Murphy’s promising skills make him an easy pick if he’s available. Beaulieu was a part of a deep Saint John Sea Dogs team who won the 2011 Memorial Cup who brings a lot of maturity and leadership to the table. Like Murphy he is good in the offensive zone and can skate well and scores a lot of points when joining the rush as a trailer. He is poised with the puck and has better size at 6’2 than Murphy. He should add some weight and get close to 200 lbs. at 6’5 193 lbs, Dougie fits the stay-at-home defensive model that the Bruins love. His size doesn’t hamper his athletic ability. He’s a plus skater and can move the puck well. He can chip in on offense but doesn’t match the above two players. He plays the body well and uses his size well. His athletic ability shows that he has a lot of room to grow, a raw player at this stage. Landeskog is Swedish but plays a North American game. He’s the most ready for the NHL but could slip down because the opinion is that he’s topped out potential-wise. He plays like a Bruin, physical but talented and would make a potential decision between he and Murphy difficult. He’s been compared to Vincent Lecavalier, plays two positions and has decent size. He has really good handles and was the post-season MVP last year. His accolades may get him drafted before the Bruins could pick him up but he’d be a good pick if he slides. Tonight marks the official end of the 2010-2011 NHL season with the NHL Awards in Las Vegas, then the 2011-2012 season starts Friday with the NHL Draft and free agency on July 1. The NHL does a great job of handing out awards and making a spectacle of it. In fact, I’m not sure that any other sport televises or organizes an event. Then again, the other three leagues don’t have so much history invested in their awards and such reverence for the sanctity of those awards. The Bruins could make a significant splash at tonight’s show with three nominations, one for Tim Thomas and two for Zdeno Chara. Keep in mind that all of the ballots were submitted before the playoffs. The Hart Trophy awarded to the league’s most valuable player. Whew. This is a tough one. Probably the toughest of the night which is weird because the Hart is the one trophy that SHOULD be clear cut. Let it be known that I am letting my seeing of these players in the postseason fog my judgment and alter my thinking. I think the race comes down to Perry vs Sedin. St. Louis is and has been great but it was the emergence of Dwayne Roloson and continued improvement of Steven Stamkos that created such a large turnaround. Daniel Sedin led the league in points and was the catalyst for the wagon that was the Canucks. His team had such an easy run and was so deep that I find it hard to measure his brilliance. Corey Perry has been a part of the Ducks squad for some time now but has never put up nearly as many points as he did this year. His previous high was 76 points and he’d never scored more than 32 goals. It’s no coincidence that with his emergence the Ducks went from 11th to 4th in one year’s time. Who should win: Corey Perry because he transformed a shallow Ducks team into a legit threat in the West. Who will win: Daniel Sedin because voting ended before he disappeared in the playoffs. The Vezina Trophy awarded to the league’s best goaltender. In a complete contrast to the above, this figures to be least dramatic award of the night. Tim Thomas had the award all but sewn up half way through the year but strong showings by Roberto Luongo and Pekka Rinne made it an interesting race all the way through. This race should come down to Tim Thomas and Pekka Rinne and Rinne isn’t getting as much respect as he should because of where he played. Luongo played great largely because he didn’t have to play great (if that makes sense). In the regular season opponents had to deal with the Sedins and with the Canucks largely playing in the offensive zone there were a lot of easy nights for Luongo. Rinne on the other hand had to stand on his head regularly. The Preds didn’t have much of an offense and Rinne essentially willed the team into the second round and kept the series tight as long as he could against the Nucks. Tim Thomas had one of the best seasons by a goaltender ever. He proved his Vezina wasn’t a fluke, and actually topped that season. He kept the Bruins afloat at times when the offense went cold and almost always made the big save. Who should win: Tim Thomas because he had one of, if not the best season by a goalie in league history. Who will win: Tim Thomas. Seriously, you guys saw how good this guy was, right? The Norris Trophy awarded to the defenseman who demonstrates the greatest all-around ability to play the position. Another tough one, not because nobody seized the award but because all three were so good. Shea Weber showed that he’s more than a big shot by becoming a pseudo shutdown defenseman. Nick Lidstrom showed how good he still is despite being 40+. Chara rebounded from an off year to prove that he’s one of the best all around defensemen in the league. Despite Weber being such a key cog in the Predators run I still see this as a race between Lidstrom and Chara. It seems like it’s between these two every year for the last 4-5 seasons. Depending on how much you buy into +/- the award could go either way. I’m a believer in +/- and as I mentioned before, hold a skewed view because of the playoffs. Chara shut down the line he needed to nearly every night and had good offensive numbers to boot. Lidstrom’s offensive numbers are amazing considering his age but his -2 is his worst of his storied career. That number indicates that his defensive wizardry was down a bunch this year and as a believer that the Norris should go to the best all-around d-man it’s an indictment I can’t get around. But some might, especially teary-eyed voters seeing a legend finishing his career looking like he’s still in his prime. Who should win: Zdeno Chara because he’s a force on defense and is one of the few true shut down d-men in he game. Who will win: Nicklas Lidstrom. The story is there and his numbers are damn impressive. Nick’s a legend and I don’t see how anyone could be mad at this pick. The Calder Trophy awarded to the league’s most outstanding rookie player. In a year where everyone was talking about Taylor Hall and Tyler Seguin these three rookies exceeded expectations and were the heads of an impressive rookie class. Each scored 30+ goals and had more than 50 points this season. Each were called upon by their own teams and each were of the most important players on their team. I see this race being between Grabner and Skinner, two players with very different paths to their rookie campaigns. Skinner was placed on a bad Hurricanes team which missed the playoffs on the last game of the season but had quite the turnaround anyways. Grabner came out of nowhere to finish in the top 10 in goals. Grabner’s team was terrible but his talent was electrifying. Skinner was helped out a lot by Eric Staal and Skinner was the youngest player in the league. Whoever wins it will deserve it and will be a great story. Who will win it: Jeff Skinner because he came into the league and was a great player in all areas despite being 18.
Who should win it: Probably Jeff Skinner. Grabner is great but he’s had a while to get used to professional hockey. Skinner has not. Jack Adams Award given to the coach who has contributed the most to his teams success. Who should win: Dan Bylsma because of all the injuries he had to deal with. Who will win: Dan Bylsma. Alain is a stiff and Trotz is good but Rinne/Weber were the reasons for success. Lady Byng Trophy awarded to the player who most exemplified sportsmanship combined with a high level of play. Who should win: Martin St. Louis. 99 points and only 12 PIMs. Who will win: Nicklas Lidstrom because it’s one of the last chances to give him hardware. The Selke Trophy awarded to the forward who best exemplifies the defensive aspects of the game. Who should win: Pavel Datsyuk’s the best overall forward in hockey but probably didn’t play enough. Who will win: Ryan Kesler because he had a breakthrough year and played good in all areas. Mark Messier Leadership Award awarded to the player with the best leadership qualities. Who should win: Zdeno Chara because he took a team who collapsed to the Cup by evolving into a true Captain. Who will win: Nicklas Lidstrom because he’s Nicklas Lidstrom.